The B.C. government is getting rid of tolls on the Port Mann and Golden Ears bridges starting Sept. 1, Premier John Horgan has announced. Horgan made the announcement in Port Coquitlam on Friday morning, following through on one of the key planks of the NDP election campaign this spring. "These tolls are unfair to people who live in the Lower Mainland and to people who live in particular areas of British Columbia. 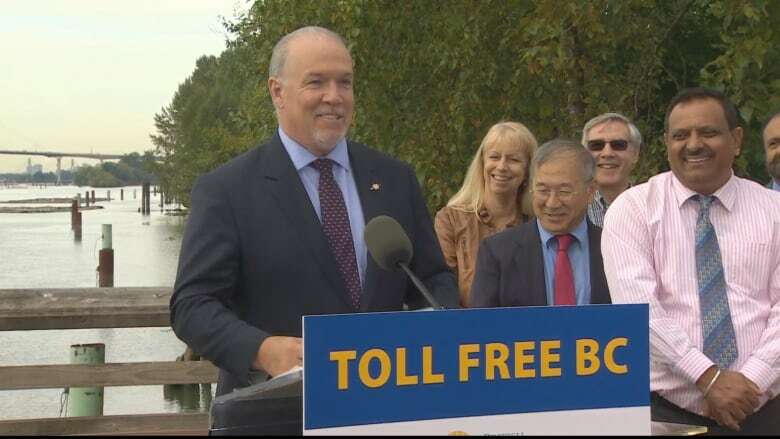 If you live in Kelowna, you don't pay tolls to cross a bridge," Horgan said. "You shouldn't have to pay tolls because of where you live." The NDP government estimates the move will save people who commute over the Fraser River an average of $1,500 each year. Commercial drivers who cross the bridge daily could save $4,500, according to the province. Bills for tolls up to and including Aug. 31 will still have to be paid. The cost of eliminating the tolls is estimated at $132 million this year, according to the province. Horgan said remaining debt from the Port Mann will be transferred to the provincial debt. It will cost taxpayers an additional $135 million for the next few years to cover lost revenue from the bridge. The province is currently in discussion with TransLink to determine how to make up for the shortfall in revenue from the Golden Ears, which the transit authority owns and operates, the premier added. The government says it will budget for the lost revenue in the annual fiscal plan, which will be updated in early September. Previously, when critics pointed out the loss in revenue for the government, Horgan suggested the cost would be spread across the province. Green Party Leader Andrew Weaver immediately slammed the NDP government for the move. "It's unfortunate that the government has decided to proceed with this reckless policy," Weaver said in a press release. "There is no question that the affordability crisis facing so many British Columbians is a significant concern. However, this policy is high cost and low impact." He contended the province would get a higher return on investment for programs targeting things like education, student housing and child care. "Moreover, making such a massive addition to our debt risks raising interest on all debt, which ultimately prevents government from being able to invest more in important social programs," Weaver said. In contrast, Horgan insisted the loss of toll revenue shouldn't affect the province's borrowing costs. But Weaver added that tolls can help encourage drivers to find other modes of transportation, which helps to reduce congestion and pollution. Port Coquitlam Mayor Greg Moore echoed those worries in a tweet Friday morning, asking if eliminating tolls could "shift transit users back to their cars and thus increase commute times." Despite Christy Clark's promise to do the same thing in her June throne speech, the B.C. Liberals also expressed concerns about the impact on the province's credit rating and suggested that adding to the provincial debt is unfair to people who don't live in the Lower Mainland. "Transferring the debt from these bridge projects to the province is essentially telling northern and Interior British Columbians that their tax dollars will be subsidizing Metro Vancouver commuters," finance critic Shirley Bond said in a news release. She pointed out that the move will impact 180 people who work in toll collection. The government said Friday that some of those workers could be shuffled into new positions and those who lose their jobs will be given severance packages. Though tolls may be gone, it appears road pricing may still be an option in B.C. Horgan sidestepped a direct question about the issue, but said the Mayors' Council on Regional Transportation is discussing a number of ideas for addressing congestion and providing revenue for infrastructure. "We're awaiting those discussions, and we'll make our decisions based on what comes back from that consultation," he said. 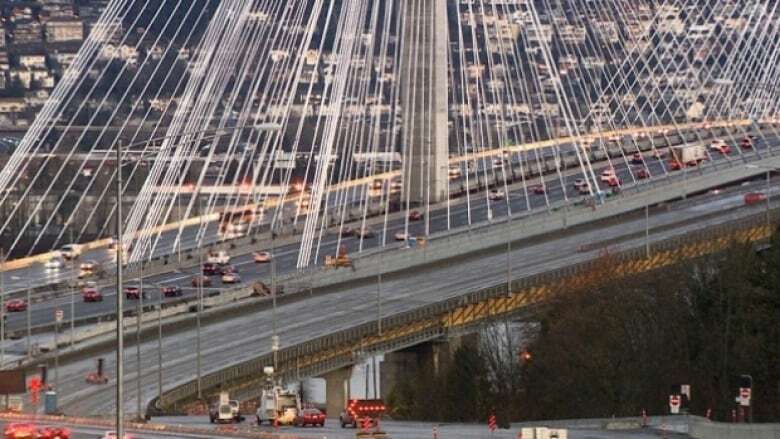 What's going to happen to the bridge proposed to replace the Massey Tunnel?